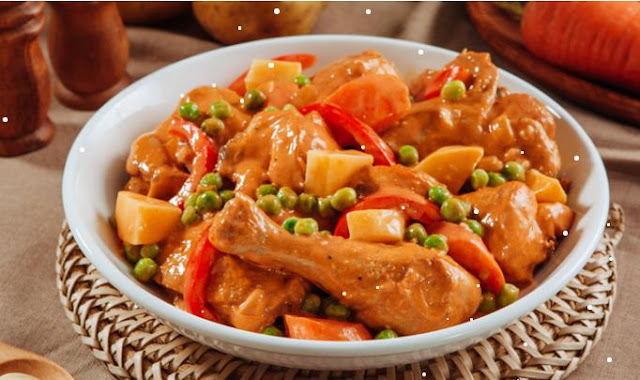 Enjoy this signature Filipino dish that's made more special and delicious by Lady's Choice Real Mayonnaise. Cut chicken into 8 pieces (2 breasts, 2 legs, 2 thighs, 2 wings). Brown chicken on all sides with 4 tablespoons cooking oil on medium heat. Remove chicken and set aside. On the same pot, saute onions and garlic until fragrant. Stir in tomato sauce and chicken stock into the pot. Add chicken and bay leaves. Simmer for 30 to 40 mins. Add in Lady’s Choice Real Mayonnaise until the mixture becomes smooth, creamy and velvety. Add the sugar, green peas, and fish sauce. Slowly stir in mayonnaise mixture. Season with salt and pepper to taste.